Winemaker Jamie Brown of Waters Winery has taken a somewhat unforgiving path to success. A Walla Walla native, Brown became interested in winemaking as he watched the local wine industry grow and a number of friends enter the field. A musician and songwriter, the relationship between art and winemaking appealed to Brown’s artistic sensibilities. Waters produces three vineyard-designated syrahs. The first is from Loess (pronounced ‘Luss’) Vineyard, an estate vineyard for Leonetti Cellar. Situated near the Blue Mountains at an elevation of 1,100 feet, this vineyard receives eighteen inches of rainfall annually, considerably higher than many in the valley. The second vineyard-designated syrah comes from Forgotten Hills. This estate vineyard, planted in 1996, lies in the eastern section of the valley. The soils here are a mixture of basalt, silt, and sandy loam. 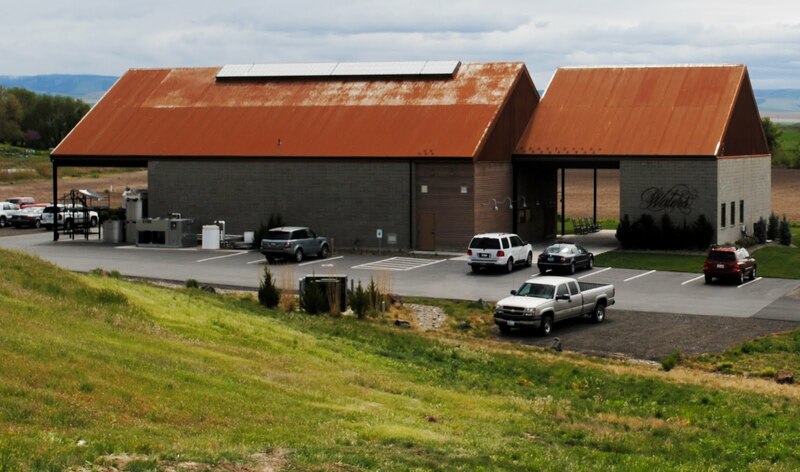 The third syrah is from famed Pepper Bridge Vineyard, located near the Oregon border. The vines at Pepper Bridge are planted on silt loam, and the vineyard sits at an elevation of 900 feet. Though these three vineyards are reasonably short distances from each other, they provide fascinating contrasts. In each of the wines the use of limited new oak puts the focus clearly on the vineyard. Site differences come to the fore, as do the variations in vintages that can often be minimized by blending from vineyards situated across large areas. In some years, these artistic decisions can be unforgiving. In others, when the vintage conditions are just right, they can be exultant. The 2007 vintage releases are such an example - an exultant celebration of an exceptional vintage. 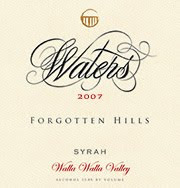 Waters Forgotten Hills Syrah in particular stands as one of the best wines to emerge from this heralded vintage. This wine displays compelling aromatics of violets, light game, and intensely pure fruit. The palate is seamlessly put together, anchored by a backbone of acid. Given the exceptional vintage and Brown’s deft, artistic touch, the entire lineup is the best Waters has produced to date. Waters Winery produces 5,000 cases annually. Rating: + (Good) Pale salmon colored. Lots of floral aromas along with melon and citrus. Bright and acidic on the palate with cherry and watermelon flavors. 67% Syrah, 33% Viognier. 12.5% alcohol. 185 cases produced. Rating: * (Excellent) A fascinating, appealing nose with funky aromatics of earth, nuts, and savory notes. Lots of puckering red fruit flavors on an enjoyable palate marked by a cranberry laden finish. 100% Syrah. Minick Vineyard. Aged in neutral French oak. 1,054 cases produced. Rating: * (Excellent) A pretty nose with pepper, herbal tones, and savory spices accented by floral notes. Beautifully textured on the palate with red fruit, savory flavors, and a touch of smoked meat. 97% Syrah co-fermented with 3% Viognier. Aged in neutral French oak. 190 cases produced. Rating: ** (Exceptional) On the nose, an exclamation point of aromatics. Spice, light game, and floral notes. On the palate, a beautifully textured and nuanced wine full of game and fruit flavors. An accomplishment of a wine. 100% Syrah. Forgotten Hills Vineyard. Aged in French oak (approximately 10% new). 514 cases produced. Rating: * (Excellent) Spicy, herbal, touches of chocolate, savory notes, and tart red fruit on an attractive nose. Tart and clean with abundant red fruit on the palate. Finish lingers on and on. 100% Syrah. Pepper Bridge Vineyard. Aged in French oak (approximately 10% new). 298 cases produced. Rating: * (Excellent) A very pretty nose with currant, herbal streaks, and anise. Tart and puckering with lots of cranberry flavors on the palate. 100% Cabernet Sauvignon. Cold Creek and Pepper Bridge vineyards. 346 cases produced. Rating: ** (Exceptional) Nose is locked up pretty tightly at the moment but shows light herbal notes, licorice, freshly ground cranberries, pencil shavings, and very light earth aromas. Pretty fruit flavors shine through on an elegantly structured palate. Give two years. 85% Cabernet Sauvignon, 11% Merlot, 2% Malbec and 2% Petit Verdot. Cold Creek, Pepper Bridge, Portteus, Seven Hills, Nostra Terra, and Sagemoor vineyards. 100 cases produced. Waters Wines have been Excellent since the start. Good to see they're finally getting some recognition! Excellent profile, Sean. I have long been a fan of Jamie's work, especially w/ the Forgotten Hills Syrah; but 07 hit a new mark. That wine is an absolute classic. We were able to enjoy the Waters wine dinner Spring Release weekend, and not only is Jamie a great winemaker, but an excellent host as well. We're huge fans of Waters, and it's great to see them getting some press. We have been enjoying Waters Syrah for two years. The winery provides FREE shipping if your order is at least 6 bottles.